Devil's claw belongs to the sesame seed family (Pedaliaceae). Its spiny fruits give rise to its common names 'devil's claw' and 'grapple plant'. The hooks on the fruits can get entangled in animals' fur and hooves, which aids dispersal of the seeds. The specific epithet procumbens means prostrate, referring to the creeping stems of the plant. The only other species in the genus Harpagophytum is H. zeyheri. This is also found in Southern Africa, growing in the Kalahari sands, but the fruits have much shorter spiny arms than those of H. procumbens. Devil's claw belongs to the sesame seed family (Pedaliaceae). Its spiny fruits give rise to its common names 'devil's claw' and 'grapple plant'. The hooks on the fruits can get entangled in animals' fur and hooves, which aids dispersal of the seeds. Harpagophytum is a Greek translation of the common name 'grapple plant'. The specific epithet procumbens means prostrate, referring to the creeping stems of the plant. The only other species in the genus Harpagophytum is H. zeyheri. This is also found in Southern Africa, growing in the Kalahari sands, but the fruits have much shorter spiny arms than those of H. procumbens. 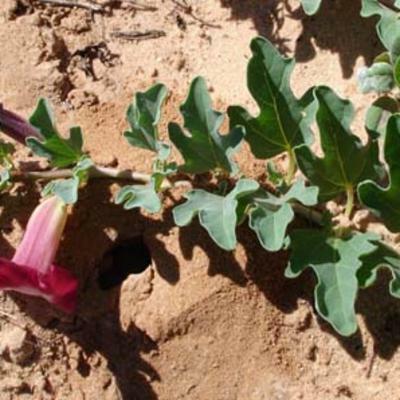 Devil's claw has been used for centuries by people living in the Kalahari as a medicinal plant to treat a wide range of illnesses, from digestive system disorders to infections and sores. Root extracts contain the iridoid glycoside, harpagoside, which has been found to be effective in the treatment of degenerative rheumatoid arthritis, osteoarthritis, tendonitis, kidney inflammation and heart disease. Tubers are collected by local people, who are often from poor rural communities across Southern Africa, and sold for export. Devil's claw is now widely used as a herbal medicine in the West for its anti-inflammatory and analgesic properties. In 2001, for example, devil's claw accounted for 74% of the total number of prescriptions for rheumatism in Germany. 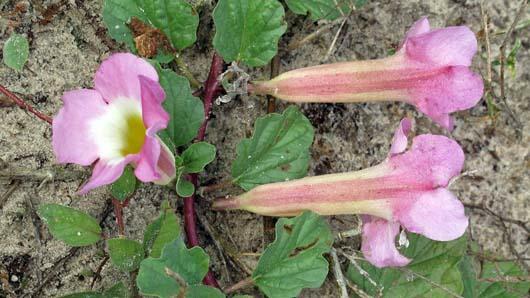 Devil's claw is widespread in the Kalahari Desert of Southern Africa. It is found in Angola, Botswana, Zambia, Zimbabwe, Namibia, Mozambique and South Africa. Harpagophytum procumbens is a perennial herb with a succulent taproot. The annual, creeping stems can be up to 2 m long. They grow from a primary (or 'mother' tuber) whose taproot can be up to 2 m deep. Secondary tubers (called 'babies') develop on fleshy roots growing from the primary tuber. They can be up to 25 cm long and 6 cm thick. The secondary tubers contain stachyose, a photosynthetic storage product, thought to be an adaptation to drought conditions. The leaves are simple and opposite, up to 6.5 cm long and 4 cm wide. They are deeply or shallowly lobed. The flowers are tubular, 5-6 cm long, and are normally light purple or pink (sometimes white), but yellow inside the tube. The fruits are large, up to 15 cm in diameter, and have four rows of curved arms with recurved spines. The seeds are dark brown or black. 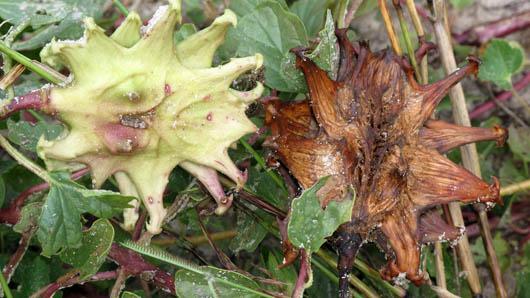 Devil's claw flowers in the summer (November to April) and fruits from January. 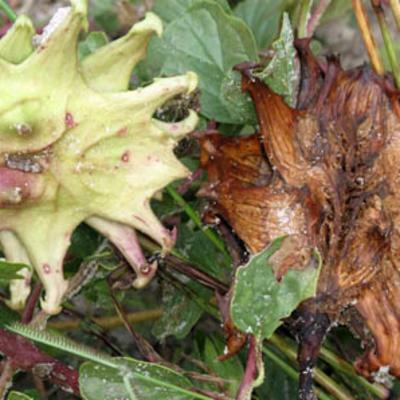 The main threat to devil's claw is over-harvesting for medicinal use. The tubers are an important source of income for many people living in the Kalahari. Wild-harvesting of devil's claw tubers can be sustainable if only some of the tubers are taken and if enough are left behind for the plants to regenerate. However, in some areas the tubers have been over-collected and the species is becoming rarer. It is difficult to grow devil's claw in cultivation, so most of the tubers used for Western medicine come from plants growing in the wild. Micropropagation techniques will help to conserve the species ex situ, and potentially provide an alternative to wild-harvested supplies for the herbal medicine trade. A propagation protocol that does not require fertilizer or water has also been developed for use by small-scale farmers in the dry regions of southern Africa where devil's claw occurs naturally. 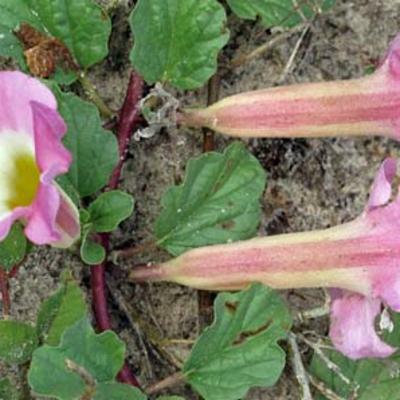 Devil's claw is classified as a protected species in Botswana, Namibia and South Africa. Permits are required for harvesting and exporting it. Both species of Harpagophytum are listed under CITES in Annex D. No part of the tubers or roots can be traded within the European Union without proper licenses. Most of the world's supply of devil's claw comes from Namibia, with lesser quantities from South Africa and Botswana. A major impediment to sustainable harvesting is the low price paid to harvesters. The Sustainably Harvested Devil's Claw (SHDC) project in Namibia (which began in 1997) suggests that improved benefit sharing for harvesters leads to better resource management and conservation, by giving harvesters a financial incentive to ensure the tubers are not over-harvested. The project also shows the importance of traditional knowledge (e.g. the best time to harvest, and how to avoid damaging the plants). The project contributed to the development of Namibia's policy on devil's claw and scientific research on the impact of harvest on growth rates to determine annual sustainable yields. Is commercial cultivation of devil's claw the answer to sustainability? 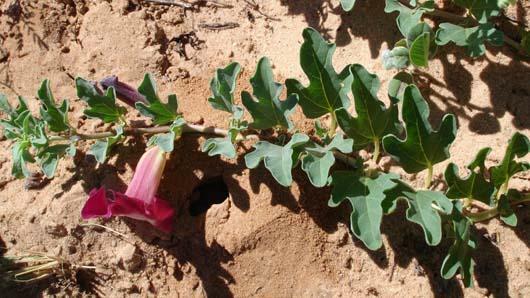 Although difficult, cultivation of devil's claw is possible and at first glance would appear to solve the problem of sustainability. Commercial cultivation helps to reduce the pressure on wild plants, and can improve the quality of the harvested product. Cultivation also provides an opportunity to restore degraded land where unsustainable harvesting has occurred in the past. But some have pointed out the potential negative impact on the livelihoods of small-scale rural harvesters if large quantities of cultivated material dominated the export market and drove down prices. Samples of fruits and roots of devil's claw are held in the behind-the-scenes Economic Botany Collection at Kew. These specimens are made available to researchers from around the world by appointment. Sandy soils particularly in open, trampled and over-grazed lands where grass and herb cover is low, but can also be found in dry savanna or open woodland. Not evaluated globally. Assessed as Least Concern (LC) according to IUCN Red Data List criteria in South Africa. Assessed as Lower Risk-Near Threatened in Botswana. Extracts of devil's claw are used in medicines, high doses of which could be hazardous. In Southern Africa grazing animals can be injured if they tread on the sharp 'claws' of the fruit, or may starve if the fruit gets caught in their mouths. Perennial herb with several prostrate annual stems from a succulent taproot, with additional tubers on lateral roots. Leaves narrowly ovate to ovate, up to 65 mm. long and 40 mm. broad; petiole 30–45 mm. long; lamina usually pinnatilobed, with 3 or 5 main lobes (terminal lobe included), sometimes polymorphic. Limb of corolla purple or (often in subsp. transvaalense) yellow, 25–40 mm. in diam. ; tube usually light purple or pink, occasionally white, outside, usually more or less yellow inside, 50–60 mm. long. Fruit with 4 rows of curved arms bearing recurved spines, the length of the longest arm exceeding the width of the capsule proper, the total diam. of fruit up to 15 cm. Seeds 25–30 in each loculi, in 4 rows. Launert, E. (ed.) (1988). 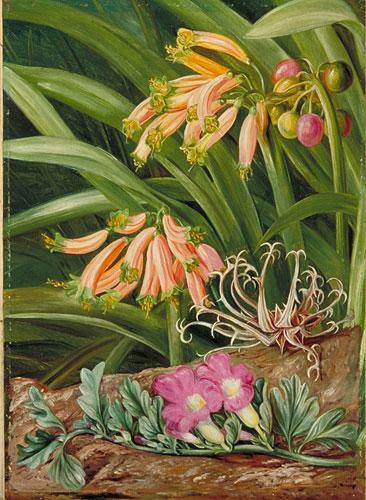 Flora Zambesiaca 8(3): 1-118. Royal Botanic Gardens, Kew. Gibbs Russell, G. E., W. G. Welman, E. Reitief, K. L. Immelman, G. Germishuizen, B. J. Pienaar, M. v. Wyk & A. Nicholas (1987). List of species of southern African plants Memoirs of the Botanical Survey of South Africa 2: 1-152. Smithies, S. (2006). Harpagophytum procumbens. South African National Biodiversity Institute. McGregor, G., Fiebich, B., Wartenberg, A., Brien, S., Lewith, G. & Wegener, T. (2005). Devil’s claw ( Harpagophytum procumbens): an anti-inflammatory herb with therapeutic potential. Phytochemistry Reviews. 4 (1): 47-53. Springer, Netherlands. Stewart, K.M. & Cole, D. (2005). The commercial harvest of devil's claw ( Harpagophytum spp.) in southern Africa: the devil's in the details. Journal of Ethnopharmacology 100 (3): 225-236. Kathe, W., Barsch, F. & Honnef, S. (2003). Trade in Devil’s Claw (Harpagophytum procumbens) in Germany – Status, Trends and Certification. FAO report. Golding, J.S. (2002). Southern African Botanical Diversity Network Report (SANBI). Report No.14. Southern Africa Plant Red Data Lists. SABONET. Van Rooyen, N. (2001). Flowering plants of the Kalahari dunes. Ekotrust. Launert, E. (ed) (1988). Pedaliaceae. 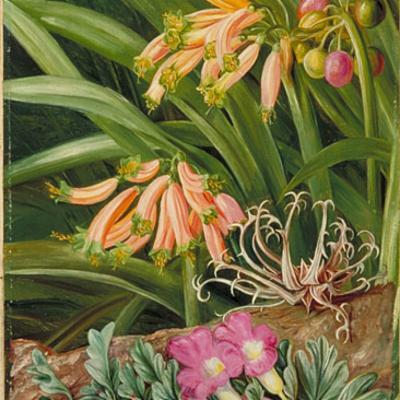 In: Flora Zambesiaca, Vol. 8, Part 3. Royal Botanic Gardens, Kew.